The series is presented without explanation or narration as a showcase of surreal footage—animations, short films, music videos, viral videos, film and TV clips, stock footage and morphing psychedelic imagery—arranged around a single loose theme (expressed in the episode title) and blended without pause into a single continuous presentation. Each episode is edited using Final Cut Pro, along with Adobe Photoshop and Adobe After Effects for further manipulation (often employing data-moshing techniques). Hughes observed a large portion of producing episodes to stem from "finding the right music to go with the visuals, or vice versa", and found transitions to "really help keep it moving." Likewise, Hughes digressed from Liquid Television's use of longer segments in order to make the series a "larger event rather than a series of smaller events", and found visual effects and transitions to be "a huge part" of his theory in making an episode. Starting in Season 7, the series began airing episodes produced by guest curators. A compilation of videos that were once considered to be featured in the first season had been published on the network's official blog. [c] These videos, extending into its second season as well as hosting various other supplemental material, have since been published onto Network Awesome. A compilation of material from the first season and additional shorts was given a theatrical release at Cinefamily on August 25, 2012, which Hughes attended. Its pilot episode, "Animals", premiered on Adult Swim on New Year's Day 2011 at 4 a.m.; it was broadcast twice in a row, back-to-back. Episodes have continued to air in this time slot—considered a graveyard slot in broadcast programming—and as a result of this and its small selection of episodes, the series remains relatively unknown on the network. However, Austin McManus of Juxtapoz noted word of mouth to be "gradually spreading" about it. :82 He and the network also described the show as a cult phenomenon. :89 Three specials have been produced: "Dan Deacon: U.S.A.", broadcast July 6, 2013, consists of surreal footage of American landscapes, with music from the last four tracks of the album America by Dan Deacon. A second special—the second-season episode "Nightmares" played in literal reverse—aired after Halloween night on November 1, 2014. The third special is a music video of Deacon's song "When I Was Done Dying" from his album Gliss Riffer animated by nine directors featured previously in Off the Air, that broadcast March 24, 2015. It has received positive critical reception, with McManus conducting an eight-page interview and profile of Hughes in appreciation of the series. :82–89 The magazine had previously published a special issue centered on the network and its shows in July 2012, but overlooked Off the Air, presenting an "opportunity to shed a little insight and background on an extraordinary unique show. ":83 Speaking from the first time he watched it, McManus praised it for not being "your typical try-too-hard-to-be-weird production. ":82 In Adweek, Sam Thielman ranked it second place out of 18 other programs on the network. He tied it with the network's parody infomercial specials and wrote that it was "in the same category as King Star King among things that are so cool and strange that they look like they should probably be part of a video installation in an art gallery somewhere." For Neon Tommy, Jeremy Fuster called it "a dark, unspeakable corner of television where no light can reach and only the sleepless and drug-addled dare to venture." Amanda McCorquodale of the Miami New Times joked that, for artists featured on the show, "nothing compares to the prestige of sharing a network with Tim & Eric and Brak, right?" Ultimately, she saw it as the "already bizarre network's foray into out-there visual experimentation." Writing for The Fader, Matthew Trammell regarded it as "when things get really interesting." PQ Ribber of The Overnightscape Underground dubbed the series a "modern version" of Liquid Television and called it "really kinda spiffy, and trippy, and cool." Casper Kelly sought inspiration from the show during the production of his short film for the network, Too Many Cooks. Ratings-wise, several episodes have surpassed one million views according to Nielsen Media Research. Hughes added that he follows the series' ratings when it occurs to him, but does not receive further analytics. He found it to trend on Twitter during the weeks of its airing, and likes viewing user's statuses regarding it. In particular, he enjoys reactions from people who wake up to it after falling asleep to the network, and judged from the online response that its audience would be "pretty young, late teens, early 20s" and "strangely positive and engaged. ":88 The network has broadcast praise of the show written by viewers in the form of bumpers, often hinting at further episodes being produced. Episodes have been distributed to sites like YouTube, while a continuous online stream of the show was launched by the network on September 5, 2014. On December 19, 2014, the show's Facebook page announced that additional exclusive material will be added to the livestream. ^ Before Hughes explained his process, Colin Foord of the Miami-based art collective Coral Morphologic, whose short film Oyster Vision is featured in the second episode, said he was unsure how producers sought after his film. He posited that they found it through their Vimeo account or their exposure at the Borscht Film Festival. ^ These compilations were removed following a redesign of the network's website. ^ a b danthemanwiththegarbagecan (14 October 2017). "The History of Adult Swim - Off the Air bump (10-13-17)". Retrieved 23 March 2018 – via YouTube. ^ a b c d e f g h i j k l m n McManus, Austin (June 2014). "Dave Hughes". Juxtapoz. High Speed Productions. 21 (6): 82–89. ISSN 1077-8411. ^ a b c d Me, Rev. Syung Myung & Aulwurm, Jeremiah (September 27, 2012). 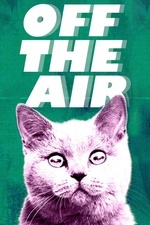 "Interview: Dave Hughes, Creator of Off the Air". Kittysneezes. Retrieved January 1, 2015. ^ a b Staff writer (February 16, 2012). "Off the Air – 11 Things We Left Online: 'Animals'". Adult Swim. Turner Broadcasting System. Archived from the original on July 16, 2012. Retrieved September 4, 2014. ^ a b c McCorquodale, Amanda (June 11, 2011). "Adult Swim Begs Miami's Coral Morphologic for Its Oyster Video Art". Miami New Times. Archived from the original on September 17, 2011. Retrieved September 4, 2014. ^ Hughes, Dave (January 5, 2014). "Off the Air – 'Color'". Million Monkeys Inc. Retrieved September 4, 2014. ^ Hughes, Dave (January 5, 2014). "Off the Air – 'Falling'". Million Monkeys Inc. Retrieved September 4, 2014. ^ "Off the Air (Adult Swim)". Network Awesome. May 12, 2013. Archived from the original on July 20, 2013. Retrieved September 4, 2014. ^ Staff writer (August 25, 2012). "EIF: Off the Air (creator Dave Hughes in person!)". Cinefamily. Archived from the original on May 21, 2014. Retrieved September 8, 2014. ^ a b Staff writer (June 10, 2013). "Adult Swim Summer Singles Program Returns with a Free 15-Track Digital Compilation of Never-Before-Released Songs" (Press release). Turner Broadcasting System. Retrieved September 4, 2014 – via The Futon Critic. ^ Adult Swim (November 1, 2014). "Off the Air – Seramthgin". Adult Swim. Turner Broadcasting System. Retrieved November 4, 2014. ^ Thielman, Sam (November 13, 2014). "The Definitive Ranking of Every Adult Swim Show Currently Running". Adweek. Prometheus Global Media. Archived from the original on November 24, 2014. Retrieved November 24, 2014. ^ Fuster, Jeremy (November 10, 2014). "Remember This Scene: Too Many Cooks and Rejected". Neon Tommy. Annenberg School for Communication & Journalism. Archived from the original on November 14, 2014. Retrieved December 8, 2014. ^ Trammell, Matthew (April 15, 2014). "Adult Swim: Discretion Isn't Advised". The Fader. Archived from the original on April 16, 2014. Retrieved September 4, 2014. ^ Ribber, PQ (May 14, 2014). "Quaquaversal Satellite – Putty". The Overnightscape Underground (Podcast). Archived from the original on June 1, 2014. Retrieved September 4, 2014. ^ Berman, Marc (November 9, 2012). "Adult Swim Weekly Ratings Scorecard". TV Media Insights. Cross MediaWorks. Archived from the original on June 3, 2013. Retrieved September 4, 2014. ^ Pucci, Douglas (October 8, 2013). "Adult Swim Weekly Ratings Scorecard". TV Media Insights. Cross MediaWorks. Archived from the original on October 15, 2013. Retrieved September 4, 2014. ^ Staff writer (May 29, 2011). Dear Adult Swim (Commercial bumper). Adult Swim. Turner Broadcasting System. ^ Staff writer (November 20, 2011). Dear Adult Swim (Commercial bumper). Adult Swim. Turner Broadcasting System. ^ Staff writer (September 18, 2011). A response on YouTube to our show Off the Air (Commercial bumper). Adult Swim. Turner Broadcasting System. ^ "Off the Air Channel". Adult Swim. Turner Broadcasting System. September 5, 2014. Archived from the original on September 10, 2014. Retrieved September 5, 2014. ^ "Off The Air". www.facebook.com. Retrieved 23 March 2018. Thielman, Sam (March 4, 2015). "What Will the 'Slow TV' Phenomenon Look Like If It Comes to the U.S.?". Adweek. Prometheus Global Media. Archived from the original on March 7, 2015. Retrieved March 7, 2015. Nectoux, Gaspard (May 2015). "Les yeux déchirés par Off the Air". Cahiers du cinéma. Phaidon Press (711): 62.